Most colleges, universities, schools, and other educational entities are classified as "not-for-profit organizations" (NPOs), as the term is defined by Generally Accepted Accounting Principles (GAAP). Contrary to what some may think, not-for-profit organizations must earn profits. Otherwise, they will not be able to replace worn-out assets or grow to meet increasing demand for their programs. Profits are the lifeblood of any organization. What distinguishes a not-for-profit organizations from a for-profit entity? Essentially, purpose. For-profit entities exist primarily to increase the wealth of their owners, while not-for-profit organizations exist primarily to serve a worthwhile social good. NPOs are not “owned,” so the idea of increasing someone’s wealth does not apply. Another important difference is the nature of revenues. Generally, for-profit entities earn their revenues, while not-for-profit organizations can receive revenues that are not earned (contributions). Those contributions can be treated advantageously by the donors for income tax purposes. Some educational institutions are operated as for-profit entities. This chapter is not concerned with those entities because the GAAP that apply to them also govern any for-profit enterprise. This chapter, then, deals with the accounting and financial reporting that apply to educational institutions that are operated as not-for-profit organizations. Although the exact origin of the accounting equation is unclear, the first known documentation of it appears in a book that was published in 1494 by the Italian Franciscan friar Luca Pacioli. Although the book, Summa de Arithmetica, Geometria, Proportioni et Proportionalita, or basically “Everything you need to know about math, geometry, and proportions)," was used primarily as a textbook, it included chapters that describe the accounting practices used by the Venetian merchants of the day (the words “debit” and “credit” originate from the Italian words “debere” and “credere”; interestingly, our use of the abbreviation “Dr” for “debit” honors its Italian origin). Those merchants used a bookkeeping system that was anchored in the underlying concept that a business can be described in two different but equivalent ways. By the first way, the THINGS that a business uses are described. By the second way, the OWNERSHIPS in those things are described. One way to understand the accounting equation (statement of financial position or balance sheet) is to think of an entity’s activities as a ball game. The left side (things or assets) can be thought of as the game itself: the stadium, the players, the bases, the ball, the action. The right side can be thought of as the scoreboard, with liabilities displaying the scores of the visiting team and net assets displaying the scores of the home team. Revenues would display “positive runs” in the home team’s favor, and expenses would display “negative runs” charged against the home team. If the scoreboard shows that the home team is scoring more runs than the visiting team, the entity is profitable. If the reverse is true, the entity is not profitable. Whether we watch the activity in the stadium and on the field (left side) or how that activity is being reflected on the scoreboard (right side), it is the single game we are observing. Another way to understand what accounting is asking of us is to compare an entity to a coin. Three features of this example are useful. First, in order to describe the coin fully, we need to talk about the heads side as well as the tails side; discussing only one side will not be enough. Second, regardless of whether we talk about heads, tails, or both, we are still describing the single coin. Third, if we were going to stand the coin on its edge, the two sides have to be perfectly balanced. It is the same with accounting. To describe an entity fully, we need to talk about its assets on the one side and its liabilities and net assets on the other. Next, regardless of whether we talk about assets or about liabilities and net assets, we are still talking about the single entity. Finally, for our description to be complete and useful, the total dollar value of all the assets must balance with the total dollar value of all the liabilities and net assets. The ability to split something apart and talk about the two sides separately, while understanding that it is still a single thing, is essential to understanding accounting. Because of the accounting equation, every transaction requires at least two entries. If only one entry were required, the equation would be thrown out of balance. An entry adding to one side must be accompanied by an entry that either adds the same amount to the other side or subtracts the same amount from another account on the same side. This is the reason that double-entry bookkeeping has been the accounting standard for more than 500 years. For the sake of illustration only, below is an example of a simple double entry. When posted, this entry will add to the balance of the Cash account and add to the balance of the Tuition Revenue account. The accounting equation stays in balance. A study of the accounting equation produces an interesting revelation: The right side describes ideas, not real things. Ownership (or in the case of not-for-profit organizations, net assets) is an idea, a mere construct of human thinking. While it is a powerful and legally enforceable idea, it is nonetheless meaningless without its universal acceptance by, within, and among the human race. If all humankind perished today, there would still be “things,” but the notion of ownership would disappear completely. One ramification of this revelation is that budgets are, indeed, imaginary. The first three lines under “Net Assets” (in the “Sports” depiction shown previously) represent the budgetary accounting that takes place. The following illustration will help you understand this concept. Let’s say that our institution is publicly supported and has received $1 million of its appropriation in cash and is budgeting $900,000 of it. Let’s further assume that (1) a department enters a requisition to purchase supplies estimated to cost $7,500, (2) when the order is actually placed the price is quoted at $7,450, (3) when the supplies are actually accepted and the invoice is received the final price is $7,475, and (4) the invoice is subsequently paid. 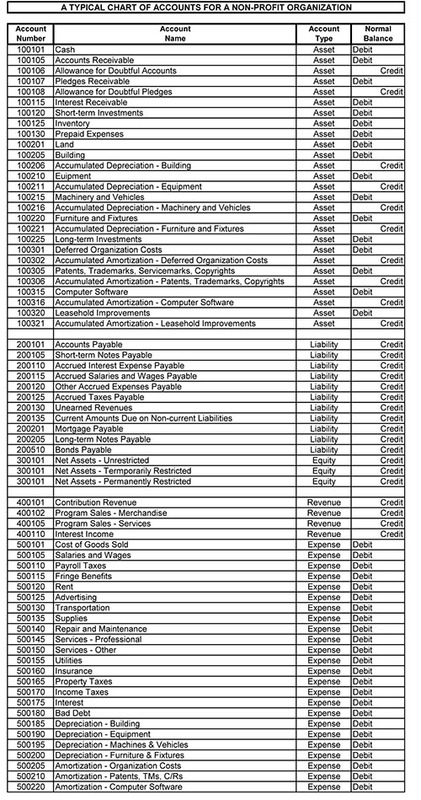 The following accounting entries are indicated. The example demonstrates that the institution’s budgetary accounting takes place on the right side of the accounting equation. This makes sense because a budget is an idea. So, while a department may regard its budget as cash, it is not cash in the strict sense; it is merely the authority to spend. That may seem like splitting hairs, but making the point is useful if only for the brief moment it takes to understand that, for most institutions, cash is kept and managed at the institutional level on the left side. Carrying the discussion further, many people think net income (or profit) is the same as cash. Theoretically, that could be possible, but practically it never happens. From the accounting equation we see that revenues and expenses are on the right side—the “ownerships” side. If revenues minus expenses equal net income, then net income is on the right side as well. A brief example will demonstrate why net income should not be thought of as cash. When these transactions are posted to their respective accounts, the Cash account will have experienced a net increase (debit) of $2,000 (-$5,000 + $7,000), while net income (a net increase (credit) to net assets) will be measured at $6,200 ($7,000 – $800). Obviously, the $2,000 increase in cash is not equal to the positive $6,200 measurement of net income. Therefore, the elements making up the right side are more correctly understood to be dashboard gauges; a car’s gas gauge indicates how much gas is in the tank, but it is not the gas. Net income (revenues minus expenses), then, is the gauge that tells how much of the asset growth (on the left side) came from “runs scored by the home team.” Net income is the notion communicated by the gauge, but the actual asset growth is experienced on the left side. For asset accounts (the left side), debit entries add to the balances; credit entries subtract. For liability accounts (the right side), credit entries add to the balances; debit entries subtract. For the net assets account (the right side), credit entries add to the balance; debit entries subtract. For revenue accounts (the right side), credit entries add to the balances; debit entries subtract. For expense accounts (although they are on the right side, they subtract from it), debit entries add to the balances; credit entries subtract. The table below communicates the same rules. What sounds wrong to most people unfamiliar with accounting is that the rules require that a debit entry to the Cash account adds to the balance, while a credit entry subtracts. The problem is the understanding, not the rules. Appendix A to this chapter explains why most people develop this wrong notion. We are talking about not-for-profit educational institutions. Some are supported governmentally, some are not. To make things only slightly confusing, technically different but basically similar generally accepted accounting principles apply to each type of institution. It is beyond the scope of this chapter to cover all of the differences. The rest of this chapter focuses on the similarities. The term “fund accounting” may be familiar to many facilities management professionals who have been in the business a long time, but fund accounting has been replaced. The new rules use the term “net assets” (instead of “fund balance”) as introduced above. Net assets are divided into classifications. The table below shows these for both types of not-for-profit institutions (privately supported and governmentally supported). These are assets, less their related liabilities, that, by mandate of the donor, may not be spent. However, the income earned from the investing of these assets may be spent. The donor may place restrictions on how the income is to be spent, or may allow the institution to spend the income generally on the institution’s mission functions. The basic gift that may not be spent is typically called the “principal” or “corpus.” The most prevalent examples of this net-asset classification are endowments. These are assets, less their related liabilities, that, by mandate of the donor, may be spent only for the purposes specified and/or only under the conditions imposed by the donor. Both principal and income, if any, may be spent. The most prevalent examples of this net-asset classification are grants from federal, state, and other governmental entities. Grants can also come from private companies, other NPOs, and individuals. In some instances, the grantor may require that the institution spend its own money first, and then submit to the grantor for reimbursement. These are assets, less their related liabilities, that have no restrictions or conditions placed upon them. That said, the assets must be used for purposes that comply with the institution’s mission. Both principal and income, if any, may be spent. The most prevalent examples of this net-asset classification are general appropriations, sales of products and services (e.g., tuition, food sales, ticket sales to athletic events), and unrestricted gifts from donors. These are assets (typically cash), less their related liabilities, that have been expended for the acquisition of capital assets. Here, the term “capital” connotes permanence. The accounting phrase that describes capital assets is “property, plant, and equipment." 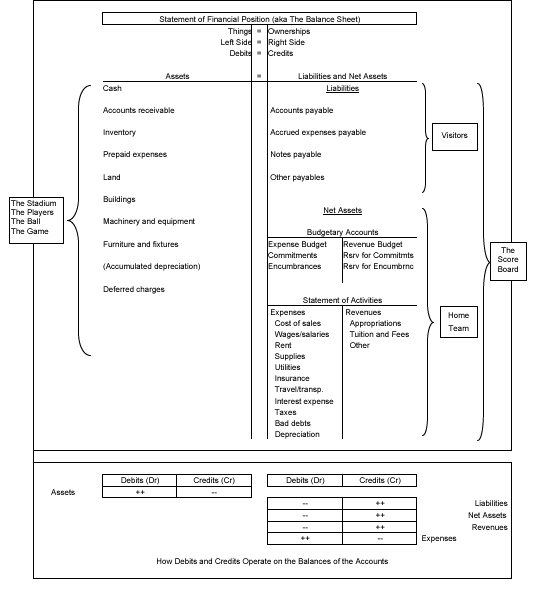 Generally accepted accounting principles define “assets” as “probable future economic benefits obtained or controlled by a particular entity as a result of past transactions or events.” Although inventory is an asset, it is not typically a capital asset because its intended presence in the organization is short term (bought and sold quickly). A building typically is a capital asset because its intended presence and use is permanent. The final deliverable of any accounting system is a set of financial statements (in accounting shortcut speak, “financials”). The typical small business will customarily produce only two financials: a balance sheet and an income statement. Most small businesses do not strictly comply with generally accepted accounting principles because they usually are not required to be audited. The purpose for mentioning this is to emphasize that most not-for-profit educational institutions must be audited every year. Therefore, the financials they produce must comply with generally accepted accounting principles. The table below lists those financials. In a for-profit setting, these statements would be known as the balance sheet. A balance sheet merely demonstrates the accounting equation (Assets = Liabilities + Equity). In the not-for-profit setting, the portrayal is the same, but with different terminology (Assets = Liabilities + Net Assets). In a for-profit setting, these statements actually represent the combination of two statements: the income statement and the statement of owners’ equity. The income statement shows the growth (or loss) of equity resulting from normal day-to-day operations; the statement of owners’ equity shows the growth (or loss) resulting from capital contributions, dividends, and other non-operating factors. Because not-for-profits are not owned, the related information is easily shown in a single financial statement. The statements show revenues, expenses, and other changes in net assets. Although their titles differ slightly, these statements report the same information. That information is organized into three basic sections: cash flows from operating activities, cash flows from investing activities, and cash flows from financing activities. For government-supported NPOs, investing activities are further divided into cash flows from noncapital financing activities and cash flows from capital and related financing activities. A question that arises is, “What is the difference between the income statement and the cash flow statement?” Although there are several parts to the answer, the main difference is that revenues and expenses are often measured and recorded at times that are different (perhaps sooner, perhaps later) than when the related cash may change hands. For example, the cash purchase of a building (reported on the cash flow statement) is a single transaction at a single point in time. The measurement and recording of the depreciation (reported on the statement of activities [or statement of revenues, expenses, and changes in net assets]) for that building will go on for the many years of its useful life. Notes to the financial statements are also sometimes referred to as “Explanatory Notes” or “Footnotes.” Although they are not technically a financial statement, they are required by generally accepted accounting principles as an integral part of the overall financial statement package. The notes explain in more detail certain captions and amounts on the basic financial statements. The first note (Note #1) is usually titled “Organization and Summary of Significant Accounting Policies.” Experienced financial statement readers go to the Notes first to get a foundational understanding of what they will be observing in the related financial statements. Accrual-basis accounting is often defined in comparison with cash-basis accounting. In cash-basis accounting, transactions are recorded only when cash comes into or goes out of the organization. Because of this limitation, cash-basis accounting is not satisfactory for most reporting and management purposes and is therefore not a generally accepted accounting principle. Accrual-basis accounting overcomes the shortcomings of the cash-basis method. Revenues are recorded when they are earned, no matter when the related cash may be received. Expenses are recorded when they are incurred, no matter when the related cash may be paid out. Accrual-basis accounting provides for a proper matching (that is, comparing within a given reporting period—usually a month, a quarter, or a year) of revenues and expenses. It attempts to measure fairly the economic impact of financial activity during a given period rather than simply keeping a tally of cash received and disbursed. The Chart of Accounts is a listing of the accounts an institution needs to record its financial transactions and to satisfy its financial reporting responsibilities. There are no hard-and-fast rules as to how many accounts an institution should have or what they should be. The most important reason to set up an account is to record, accumulate, and provide useful information. For example, a legal office would probably not set up an account titled “Inventory for Resale”; it sells service, not products. Therefore, there would be no need to know anything about inventory. A chart of accounts will likely need to change from time to time, so it typically is not a static list. 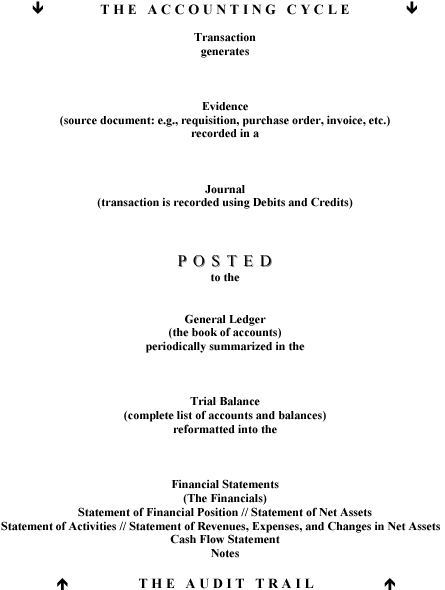 The Account Number uniquely identifies the account for journal recording and ledger posting purposes. Numbering is fairly standard, although there are no hard rules. Asset account numbers typically begin with the digit 1, Liability accounts with 2, Net Assets accounts with 3, Revenue accounts with 4, and Expense accounts with 5, 6, 7, 8, and 9. The Account Name (sometimes called Description) is a plain language label for the account. For example, the account “Cash in Bank” is distinguished from the account “Cash on Hand,” even though they both represent cash. They would be separate accounts and have different numbers. The Account Type tells us to what major financial class an account belongs: Asset, Liability, Net Assets, Revenue, or Expense. This identifier is necessary because we cannot always tell from the number or name the nature of an account. It is especially important in distinguishing the accounts that are shown on the Statement of Financial Position (Assets, Liabilities, Net Assets) from the accounts that are shown on the Statement of Activities (Revenues, Expenses). This indicates whether an account should normally carry a debit balance or credit balance. An account that carries a normal debit balance will have a positive balance if the debit amounts posted to it are greater than the credit amounts posted to it; it will have a negative (credit) balance if the credit amounts posted are greater than the debit amounts. Similarly, an account that carries a normal credit balance will have a positive balance if the credit amounts posted are greater than the debit amounts; it will have a negative (debit) balance if the debit amounts posted are greater than the credit amounts. Asset and Expense accounts carry normal debit balances. Liability, Net Assets, and Revenue accounts carry normal credit balances. Contra-Accounts, such as “Accumulated Depreciation,” carry a normal balance opposite that of the Type in which they are included. A sample chart is shown below. Not-for Profit colleges, universities, schools, and museums are mainly in the business of education, research, and public service. Most departments within a not-for-profit institution are mission funded; that is, they are given a specified dollar value of budget authority, usually at the beginning of the fiscal year, and are then held responsible for staying within that budget as they carry out what they need to do. At the institutional level, revenues are collected (from appropriations, tuition, fees, and other sources). The cash realized from those revenues is held centrally to pay for departmental expenses as the departments execute (use up) their budgets. Mission-funded departments typically do not “earn” their budgets in a true business sense. For example, although enrollment in the business school may bring in higher tuition revenue than in the journalism school, this does not necessarily mean that the business school will be given the larger budget. The decision may rest on other factors and influences not directly connected with revenue. Those decisions are typically made at the presidential, chancellor, provost, and dean level. Mission-funded departments can be financed in this way even though the product or service they provide may be perceived as “free” by the recipient. The school can control usage and demand by placing limits on class schedules, class sizes, class sections, and teaching loads. Mission funding does not work well, though, for all departments within a not-for-profit institution. For example, the institution's dining facility would be overused and its food and services abused under the mission funding model. The same would likely be true of most athletic events. For this reason, certain departments are operated under a self-funding model. They must directly earn the revenues they need to fund their budgets. Because they must sell their products or charge fees for their services, the risk of customer abuse or overuse is naturally moderated by the economic realities of supply and demand. These self-funded units are classified into two groups: auxiliary enterprises and service departments. Auxiliary enterprises are operated mainly for the enhancement of campus life. Examples are food services, copy shops, athletics, and bookstores. Service departments are operated mainly for the support of the other institutional departments. Examples are physical plant (especially with respect to providing departmentally requested remodel or renovation work), parking, motor pool, information technology, and printing. To be a truly effective manager, the facilities manager should have a solid understanding of the accounting cycle and the audit trail. These concepts are vital for effective internal control. The accounting cycle is the “path” that a transaction follows as it ultimately makes its impact on the institution’s financial statements. The audit trail is the accounting cycle in reverse and is an extremely important concept that governs not only a well-organized accounting office but also the entire organization. Depictions of the accounting cycle and audit trail follow. The accounting cycle flows down the page; the audit trail flows up. A transaction takes place, and some type of evidence or source document (for example, an invoice) is generated. The transaction is recorded in a journal (“journalized”). This is the place where we translate the transaction into its debit and credit “legs.” This is called the journal entry. Each line of the journal entry is then posted to its correct account in the general ledger, and the balance of each affected account is updated. At the end of the accounting period (usually the end of the month), a trial balance of all the general ledger accounts is prepared to (a) make sure that the total of all debit balances equals the total of all credit balances and (b) look for any unusual account balances. Any adjusting or correcting entries must be “run” through the accounting cycle, just like any other transaction. Once the trial balance reflects the correct balances, the financial statements are prepared and distributed to the appropriate managers and executive officers. In step 2, the term is record. In step 3, it is post. What is the difference? Recording is less formal than posting. Posting is regarded by accountants as a “sacred and holy” event because when it is done, it must not be erased. This ensures the integrity of the audit trail. When we look at the accounting cycle in reverse, we have the audit trail. Test whether the information on the financials can be supported by the information on the trial balance, examine the trial balance for equal totals of all debit balances and all credit balances, and examine each account balance for accuracy or reasonableness. Trace those balances back to the general ledger to see the transactions that make up those balances. Trace those transactions back to the journal to see the recordings of the transactions in their entirety. Examine the source documentation that arose from those transactions to test that they were recorded fairly, that all existing transactions were identified and recorded, and that nonexistent transactions were not recorded. It is important to understand that each transaction in an institution produces information. That information may be sorted or presented differently as it makes its way through the accounting cycle, but the information itself does not change. This characteristic is vital for the integrity of the audit trail. Indeed, the word “trail” connotes a path that can be relied upon—with certainty—to accurately guide a traveler from one point to another. In this connection, the word “posted” is held to be accurate and complete by accountants: Once a journal entry is posted to the ledger, it is never erased. If an entry is posted incorrectly or if an incorrect entry is posted, the correct solution is to formulate the correcting entry and run it completely through the accounting cycle. In this way, the “crumbs” that make the audit trail perfectly “followable” are always laid down and never picked up. This characteristic of the audit trail is essential for an institution’s auditors so that they can have complete confidence as they work their way back through the records. The integrity of the audit trail is at least as vital to facilities supervisors and managers, who need to do research from time to time to answer questions, solve problems, and create effective plans and budgets for the future. The meaning of the word “capital” as it is used in most business communications includes the concept of permanence. It is the same sense of the word that is used in the term “capital punishment.” Indeed, it is hard to think of a punishment that is more permanent than death. When an entrepreneur puts $100,000 of his or her own personal money into a business, it is classified as capital. Why? Because the entrepreneur intends for the money to stay in the business permanently, for all practical purposes. The term “capitalize” is used sometimes when organizations expend money. At other times, the term “expense off” may be used. It is helpful for the facilities manager to understand these terms as they are used by business officers and accountants. Many of us have incorrect feelings or notions about the words debit and credit. It is worth investigating why. We have learned that debit and credit are directional words, and that their effects on the balances of the different types of accounts are as shown in the table below. Now, we know that cash is an asset, and if we set an account up for it we call it an asset account. And we know from the above table that a debit entry to an asset account increases its balance. Yet too many of us find it impossible to believe that a debit entry can ever add to the balance of our Cash account. So, one of two things must be false. Either a debit entry to the Cash account does not add to its balance, or the belief that many of us hold is wrong. The latter is the case. By looking at two examples of how we have been led to believe the debit is “bad” and credit is “good,” we can see how we got ourselves to this miserable state…which really is not our fault. Looking at our table above, we can see that when the store posts the two lines of this entry, it will increase the balance of the Accounts Receivable account and increase the balance of the Sales account. We would represent the fourth Accounts Receivable to the store, and its total Accounts Receivable balance after our purchase would be $250 ($215 + $35). The point here is to understand that the account statement we will receive from the store at the end of the month comes from its Accounts Receivable control account. And when we receive our statement, our purchase will show up under which column, debit or credit? The answer is debit, because that is the entry that is reflected on the store’s books. So, how did we feel when we read our statement and saw our purchase entry under the debit column? We felt bad because the entry reinforced what we already knew: that we owed money to the store. And when we owe, we typically do not feel good about it. Therefore, our reading of the word debit and our feelings associated with it trigger negative impressions of it. Looking at our table again, we can see that when the store posts the two lines of this entry, it will increase the balance of the Cash account and decrease the balance of the Accounts Receivable account. Once again, our account statement will come from the store’s Accounts Receivable control account. When we receive our statement, our payment will show up under which column, debit or credit? The answer is credit, because that is the entry in the store’s books. So, how did we feel when we read our statement and saw our payment entry under the credit column? We felt good, because the entry reinforced what we already knew: that we did not owe the store any more. And when we do not owe, we typically feel good about it. Therefore, our reading of the word credit and our feelings associated with it trigger positive impressions of it. We must realize that our feelings about debit and credit are triggered by information reported to us and about us from the records of people who are not us! We can clearly see that the store’s journal entries comply with our debit and credit table above, and we can clearly see that when the store debited its asset accounts of Accounts Receivable and Cash, it increased those account balances. So, we must start to work on our own feelings about debit and credit and understand that it is the feelings that are wrong, not the rules. Here is another example. In our first example, we represented an Accounts Receivable to the department store. What if we represented something on the other side of the balance sheet, such as an Account Payable? Would we still wind up with our same incorrect feelings about debit and credit? The answer is yes, and here’s why. When our bank posts the two lines of this entry to its books, it will increase the balance of its Cash account and increase the balance of the DDA it has set up for us. This is accurate because our deposit increases the amount of cash that the bank has available to it to lend (in fact, that is the essence of banking: to take in money and pay a low interest rate and then lend that money out and charge a higher interest rate). The credit to your Demand Deposit account merely reflects your claim on (or ownership of) that cash. We would represent the fourth Demand Deposit Account to the bank, and its total Accounts Payable balance after our deposit would be $4,700 ($3,700 + $1,000). Again, the point here is to understand that the account statement we will receive from the bank at the end of the month comes from its A/P control account. And when we receive our statement, our deposit will show up under which column, debit or credit? The answer is credit, because that is the entry that is reflected on the bank’s books. So, how did we feel when we read our statement and saw our deposit entry under the credit column? We felt good, because the entry reinforced what we already knew: that we had money on deposit with the bank, or more accurately that we had a claim on (or ownership of) some of the cash on hand at the bank. We typically feel good about that situation. Therefore, our reading of the word credit and our feelings associated with it trigger positive impressions of it. When the bank posts the two lines of this entry, it will decrease the balance of the A/P DDA account and decrease the balance of the Cash account. The entry reflects that the bank has transferred cash to the grocery store and decreased your claim on (or ownership of) the cash still remaining in the bank. Once again, our account statement will come from the bank’s Accounts Payable control account. When we receive our statement, our check will show up under which column, debit or credit? The answer is debit, because that is the entry that is reflected on the bank’s books. So, how did we feel when we read our statement and saw our check entry under the debit column? We felt bad, because the entry reinforced what we already knew: that we have less of a claim on (or ownership of) the cash at the bank. Notice that we did not say, “because there is less cash in our account,” because that is not the most accurate way to state the situation. The bank’s Demand Deposit Account in our name is NOT cash; it is our claim against the cash that is under the bank’s custody and control. In any case, the debit entry triggers in us a bad feeling. So one more time, we must realize that our feelings about debit and credit are triggered by information reported to us and about us from the records of people who are not us! We can clearly see that the bank’s journal entries comply with our debit and credit table. These two examples demonstrate how and why we have come to have irrational feelings about the words debit and credit. It is not really our fault, because we have not had enough experience with debits and credits as we would use them in reference to ourselves. Instead, our only knowledge of them is when we see them on other people’s records about us. For that very reason, we must trust our debit and credit table, even memorize it, and then understand that it is our feelings that are wrong, not the debit/credit rules.